Researchers wanted to recreate what happened on the bottom of ancient seas. Researchers wanted to see what would happen if you dropped a dead alligator on the ocean floor. No, it wasn't because the staff at Louisiana University Marine Consortium was really bored. It was because they figured it was a good way to see what might have gone on in ancient seas when reptiles sank to the bottom. They dropped alligators -- humanely killed by the state of Louisiana -- off the state's coast in February, according to The Charlotte Observer, and recorded what happened. The idea was to imitate what happened when prehistoric reptiles fell into rivers and were carried out to sea. What happened next isn't for the faint-hearted. 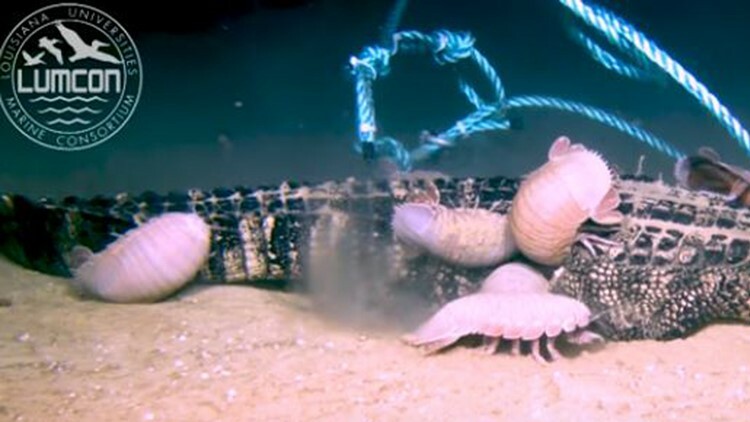 Within a day, football-sized isopods swarmed over the corpses, devouring the gators. The researchers told the Observer they're going to go back soon to see if other animals took part in eating the gators, and they say they may even find some undiscovered species when they do.